SHOULD YOU TAKE THE OPEN DOOR? We see open doors as an new opportunity or a new beginning. 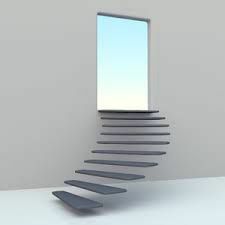 However, for every beginning that means there has to be an end to something else.That ending is what so often prevents us from walking through the door to something new. What we might be missing is a limited time offer where the staircase to the opportunity may only be available temporarily. It may have no railings or support beams beneath it. Those we can build once we decide to move forward if we so choose! The choice is always up to us…move forward or stay where you are!